Here are some terrible pictures of a bag I finished the night before our trip that's already become old news in my world... I was too interested in photographing other things to give it much attention, but the bag came in very handy for hauling around a day's worth of stuff on vacation. It's a giant box with a flat bottom and top and a heavy-duty zipper. It's lined with plain gray fabric from this shirt and has a simple inside pocket. Oh, and a patch where my iron melted a hole in the lining and I could not bear to make a third lining after the first one had been too small. I used interfacing which I thought I would hate but helped keep the bag sturdy. Now I regret not putting interfacing in the strap which has probably grown 50% by stretching out. I may or may not fix it. Man, I get so excited to make something new but when I have to make repairs, I drag my feet, maybe for years... like slippers I made my friend Cara for Christmas two years ago and just sent back with the holes patched two weeks ago. Oops. Thanks! 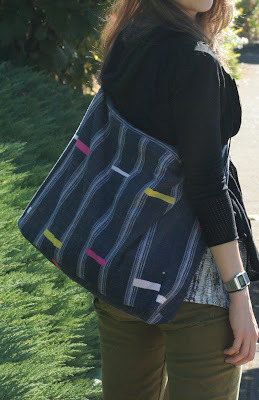 I don't think the bag does the fabric justice - it is a cool fabric. It is PAINFUL when you spend so much time on one step and it feels like for nothing. Sometimes I just can't even go back and do it again, unless I think I'm going to love, love, love it!